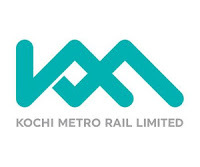 KMRL Jobs Recruitment Notification 2018.Kochi Metro Rail Limited, KMRL inviting applications for the positions of Manager, Deputy General Manager.Interested and Eligible candidates can apply for the positions. b. Desirable : Masters Degree in Transportation Engineering/Highway Engineering or equivalent. b. Desirable : Masters Degree in Electrical Engineering/Electrical or Electronics Engineering or equivalent . a. Essential : Degree in Civil Engineering with masters Degree in Environmental Engineering/PHE or equivalent. 1. Experience and age criteria can be relaxed in case of otherwise exceptionally deserving candidates. Only shortlisted candidates will be notified for interview, which will be communicated through email only. CSML reserves the right to shortlist the candidates. 2. Applicants employed in Govt./Quasi Govt./ PSUs shall apply through proper channel, after forwarding the advance copy along with the application fee and shall produce a “No Objection Certificate” from their employer at the time of interview. Acceptance or rejection of application of the candidates will be the sole discretion of the Management. Incomplete applications are liable to be rejected.